They’ve Already Played With David Byrne, Can This After-School Band Be the Next Blue Man Group? 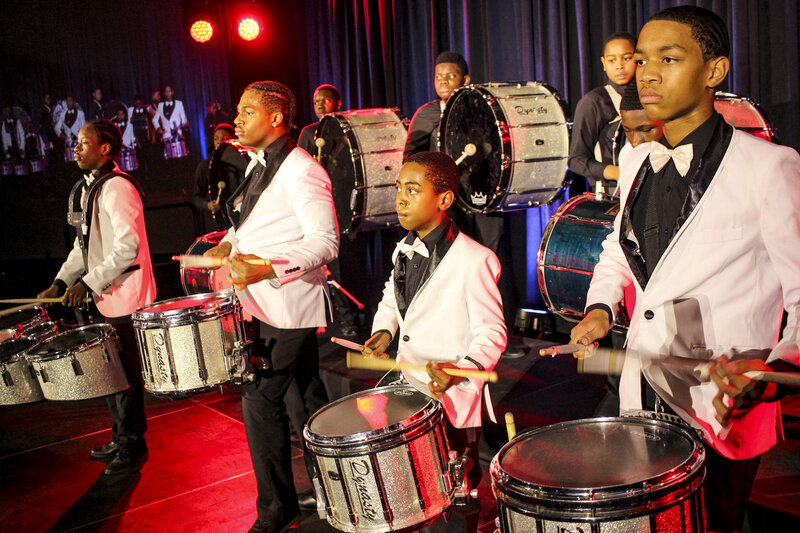 Clad in smart-looking white blazers and spotless black leather shoes, a group of Brooklyn schoolkids beat on marching drums in synchronized choreography at the Apollo Theater. The stage lights flash blue as dancers run down the aisles, performing almost acrobatic moves. The audience is enraptured, enthusiastically clapping along to the beat of the drums. The students range in age from five to 17, but this isn’t their first big gig. The troupe, Brooklyn United, performed alongside David Byrne at the Talking Heads tribute concert at Carnegie Hall, and has even made appearances on The Tonight Show with Jay Leno and Last Week Tonight with John Oliver. Tonight, the students add another impressive performance to their expansive resume. This time Brooklyn United will be the main performer on the stage, starring in Brooklyn United Live! for a weeklong run at La MaMa Experimental Theater. 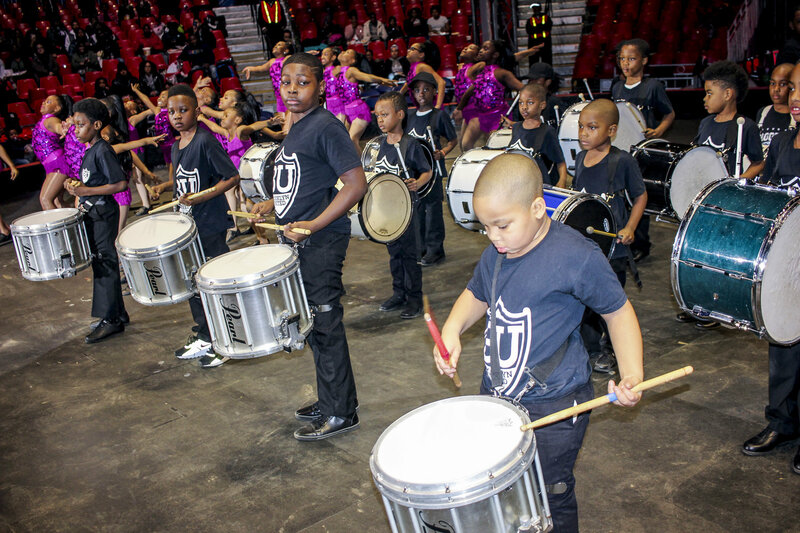 In just the five years since their inception, Brooklyn United has caught the attention of many in New York City thanks to their founder Tyrone Browne, who sought the opportunity to promote the talent he witnessed among Brooklyn youth. He decided to create a music and arts program teaching marching band which includes percussion, horns and dance. Brooklyn United, located near the border of Bed-Stuy and Bushwick, now offers after-school, weekend and summer camp programming for 500 students. Browne, who is also directing the production, sat down with Bedford + Bowery to discuss the importance of Brooklyn United and what this show means for the students. What was the reason for starting Brooklyn United? We want to show people it doesn’t matter how much money you invest in programming; as long as the quality of instruction is good you’ll always have amazing results. These kids practice every day from Monday to Friday and on weekends we’re traveling to different venues, performing. We want to instill that confidence, that belief in themselves that they can do anything they set their mind to. Why focus on drumming and dance? 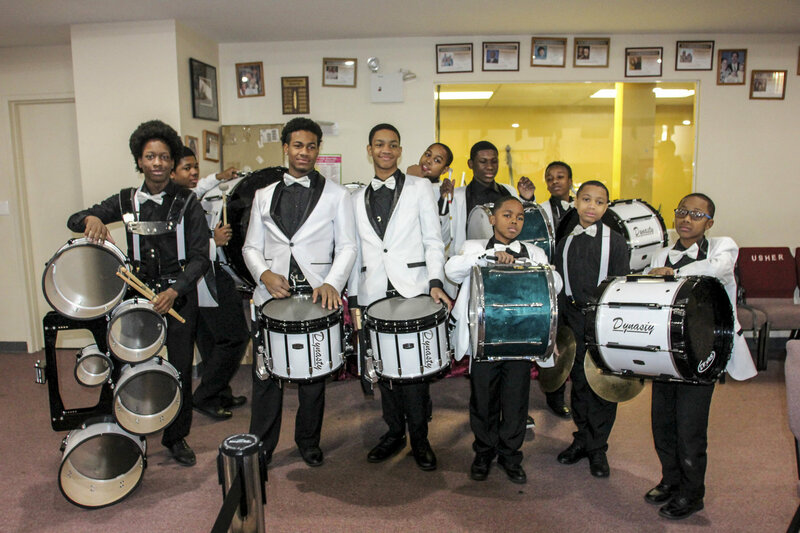 There’s a much richer history of drumming and marching bands in southern black culture and I wanted to bring that here to Brooklyn – you know, what’s something that is new and different? What is your vision for the show? When you see those stories of young people performing for the Obamas, or just young people being able to receive that type of attention, I’m always thinking how can we get there? I get emails all the time asking for our kids to perform. Someone wants a marching band at their wedding, and they see we’re different and professional. These kids show up, well dressed and ready to impress and perform. I want audiences to come out of the show and just have a different idea of the inner-city youth. Why did you decide to perform at La MaMa? I never knew much about theater but one day I decided I wanted us to perform in a bigger space where the kids could have their own show. I went around to different theater spaces and someone recommended La MaMa because they do experimental theater. I sat down with them and told them we’re a percussive performance group. They laughed, because The Blue Man Group first performed here and they wanted us to sign a contract because they never did with the Blue Man Group and now they’re a million-dollar enterprise. So they said when Brooklyn United goes big, you have to take La MaMa with you, so I signed it. Do you ever hear from students once they leave Brooklyn United? We hear from alumni all the time. They always reference Brooklyn United and how it helped them achieve. You know, band conductors for the university marching bands write to me saying the Brooklyn United graduates have so much confidence. They’re just freshmen, but have no problem defending themselves against the seniors. I’m just thinking of course they do, they’ve got that Brooklyn swagger, that Brooklyn United swagger. What about Brooklyn United are you most proud of? The parents. They just get it. They understand how important this is to their kids. These kids have the passion, they have the drive. They have to be achieving high academic grades, they’re seeing tutors, rehearsing everyday, performing on weekends and the parents champion them on. “Brooklyn United Live!” runs Feb. 21 to March 3 at the Ellen Stewart Theatre, 66 E. 4th St. (2nd Fl); tickets $25 to $30.